Which member of the NEC3 family of contracts should I use? How do I choose and use my main and secondary options? What are the roles and responsibilities of the various parties? How should I effectively manage early warnings and compensation events? Important questions can arise when working with NEC3 contracts, some of them have simple answers and others require more a detailed response. Whether you are an NEC3 beginner or an expert, the 100 questions and answers in this book are a priceless reference to have at your fingertips. Covering issues that can arise from the full range of NEC3 forms, Kelvin Hughes draws on questions he has been asked during his 20 years working with NEC and presenting training courses to advise, warn of common mistakes, and explain in plain English how these contracts are meant to be used. "Whether you are an NEC3 beginner or an expert, the 100 questions and answers in this book are a priceless reference to have at your fingertips. 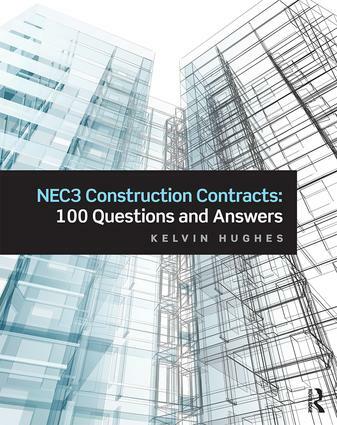 Covering issues that can arise from the full range of NEC3 forms, the author draws on questions he has been asked during his 20 years working with NEC and presenting training courses to advise, warn of common mistakes and explain, in plain English, how these contracts are meant to be used. This book lends itself to general reading or as a reference for times of uncertainty (or trouble), and would be useful to the practitioner or student in the UK or overseas." Kelvin Hughes spent 18 years in commercial management with major contractors, then the past 23 years as a consultant, including a four-year senior lectureship at the University of Glamorgan. He has been a leading authority on the NEC since 1996, was Secretary of the NEC Users' Group for ten years and has run over 1,500 NEC training courses.